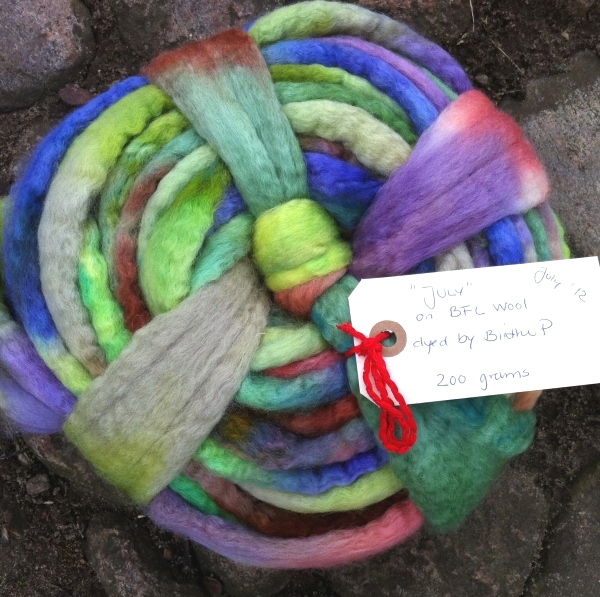 Forside / Colorways / New spindle and a new fleece too! New spindle and a new fleece too! A few days ago my friend Hanne and I went to Lystbækgård to look at some spelsau wool. We are both members of the same “spinning circle” and next time we meet (on tuesday) we are going to play around with primitive wool types. 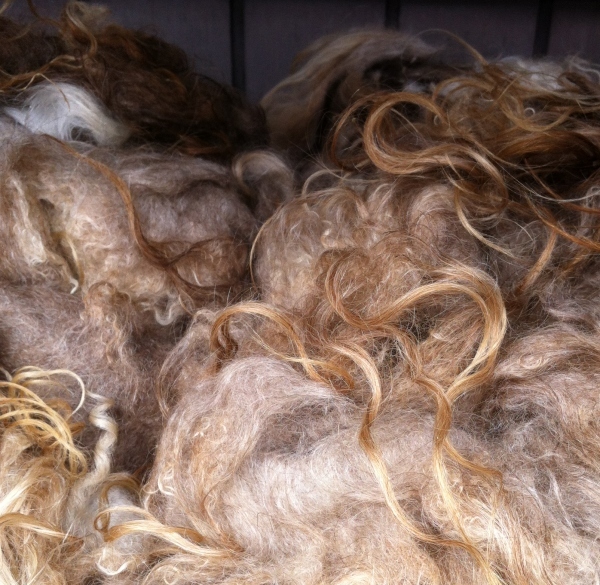 Primitive sheep races features wool that has both long guard hairs and soft down wool. We are going to separate the down fibers from the guradhairs and for that purpose we of course need some spelsau! Berit Killerich (to the left in the photo) is a professional shepherd. She owns Lystbækgård and raises the spelsau sheep. She gives sheep dog shows, makes shearing into “show-and-tell”, has a weaving school, a farm-shop with a wonderful café with organic food and drink and of course lots of premium quality wool in the barn. 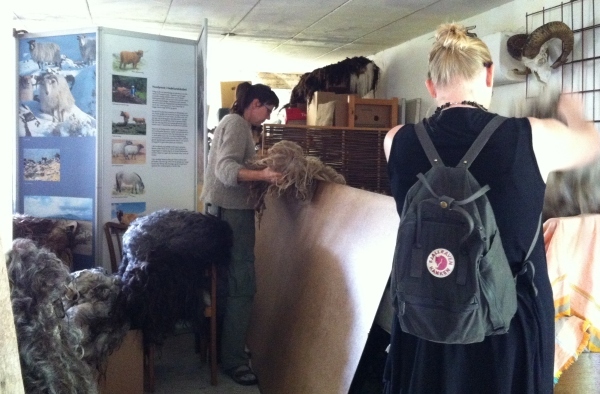 Hanne (to the right) tries to decide which fleece she’s going to bring home. In the end she got 3, one more lovely than the other! I held myself back and only purchased one fleece. But what a soft and curly beauty it is! 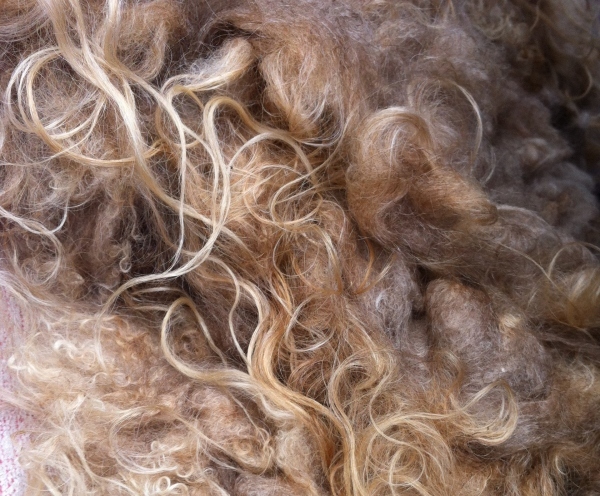 It is a light fawn or oatmeal colour (with variations), very soft to touch and with long guard hairs (curls) not so coarse as they sometimes are. Berit told me this wool came from “an elderly lady” whose wool has gotten softer over the years. Doesn’t it just look delightful? When it’s totally dry I will use my flicker to separate the two fiber types. The down will be good for soft knitting yarn and the long, shiny guard hairs I’ll spin into weaving yarn, for tapestry weaving! A Golding, a lightweight one. 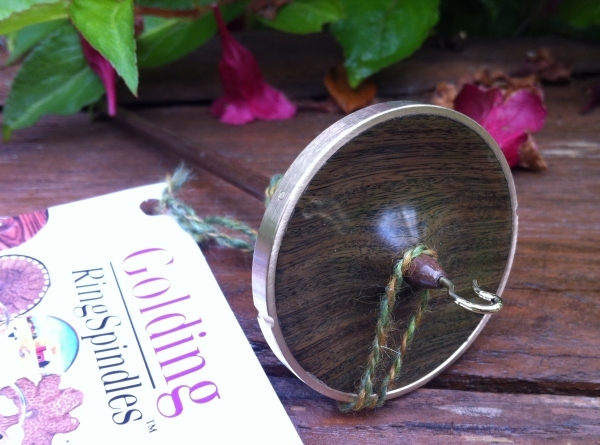 For a Golding it is quite plain and simple, but I have been eyeing this lovely brown-green wood, called Lignum vitae, for some time and now I had the opportunity to get one! It’s a perfect spinner. Completely balanced, looong time spinning. That’s Golding. Always perfect tools. And lovely to look at too! i kind of like it. How about you? Næste indlæg: Finally something finished..